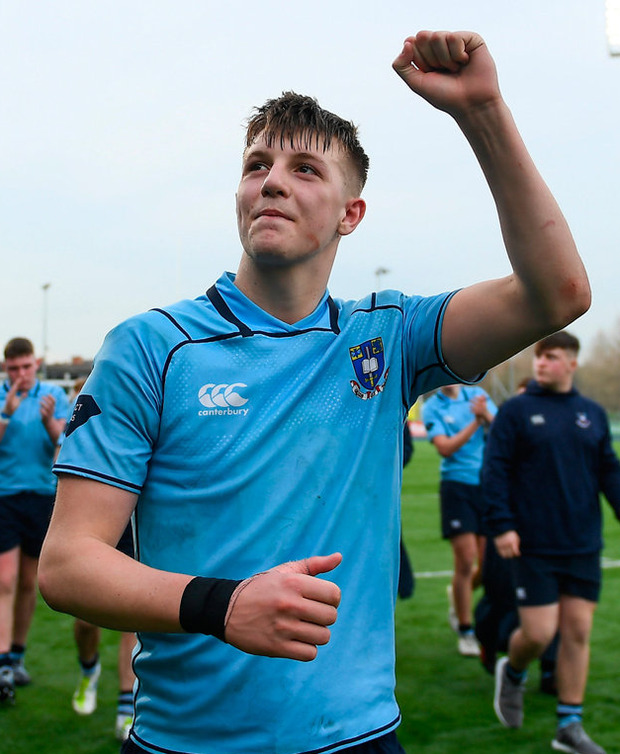 For the first time since 1976 a new name appears on the Leinster Schools Senior Cup final stage as Gonzaga make the short journey to the RDS having taken the best part of 70 years to get there. And lest that is interpreted as some form of criticism, it is anything but given that Dublin 6 is now very much a three-way street with Gonzaga alongside Terenure and St Mary's as an ever-growing force in the Leinster schools game. Tomorrow is a massive occasion in the history and further development of the game at the Sandford Road school. To hugely influential No 8 and captain Jack Barry is bestowed the honour of becoming the first Gonzaga player to lead the green and whites into senior final action and just 70 tantalising minutes away from the greatest prize in the Leinster underage game. Make no mistake, with the League title already in the Ranelagh trophy locker, the class of 2019 are here on merit, and in with a very real chance of taking the cup final spoils at the first attempt. A narrow squeeze against Castleknock in the opening round (26-24) has been followed by really substantial performances against Terenure (19-11) and Clongowes (22-19) in the quarter-final and semi-final respectively. The win over Clongowes was massive psychologically in that they not only beat one of the consistently big players in Senior Schools rugby but also one of the two 'big sister' schools (along with Belvedere). And, of course, more than anything it took them through to a first ever final. In their way is another juggernaut and while St Michael's might have but two under 19 titles thus far to their name, the Ailesbury Road school (probably located even closer to the RDS than their final rivals) is alongside Blackrock, Belvedere, Terenure and Clongowes at the top table of Leinster Schools rugby. They are led by Mark Hernan, son of former Roscrea, Irish Schools and St Mary's College RFC great Ray, and he is part of a magnificent Michael's back-row alongside Jack Guinane and Will Hickey. Guinane and Hickey are but two of 13 back from the all-conquering Junior Cup-winning squad of 2017. In contrast to Gonzaga, they announced their intent early by way of a comprehensive win over Kilkenny (52-10) in the opening round. That was followed up by the big one and the scalp they wanted more than any other when beating Blackrock convincingly on a 16-10 scoreline in the quarter-final. And this time, unlike 12 months before when surrendering a 16-point lead to Belvedere in the semi-final, they edged through by the narrowest of margins (16-15) against the same opposition but were full value for that one-point win. So it's all to play for with twice champions Michael's the pre-match favourites albeit fielding a relatively young side against a quality Gonzaga outfit with everything to play for and little to lose. We still suspect that Michael's might just have that little more class through Andy Smith, Eddie Kelly, Chris Cosgrave, Mark O'Brien etc. Yet, when CBC made that initial breakthrough all those years ago Michael Mullen's side returned to Monkstown with the trophy in tow. Gonzaga - C Hennessy; F ó hOisín, F O'Grady, K Morgan, B Barron; H Colbert, J Connolly; H Godson, H Fitzgerald, R Shaw; L Tyrell, J Coolican; C Kirby O'Briain, T Cullen, J Barry (capt). St Michael's - A Smith; E Kelly, C Cosgrave, S O'Kelly, M O'Brien; N Carroll, R Gilsenan; J Boyle, L Barron, F Finlay; S Woods, J Fish; J Guinane, M Hernan (capt), W Hickey. Captain Nathan Murphy led the way to Vinnie Murray Plate glory with a try and three conversions for St Andrew's at Energia Park. Independent.ie Newsdesk Rockwell lifted the Clayton Hotels Munster Schools Junior Cup title at Irish Independent Park yesterday, with first-half hat-trick of tries proving decisive. Des Berry St Michael's came from nowhere to down Blackrock with two late tries by Seán Egan and David Fegan, claiming the Leinster Junior Cup in dramatic circumstances at Energia Park.